SEAHILL is located at 83 - 123 WEST COAST CRESCENT in district 05 (Buona Vista, West Coast) of Singapore. 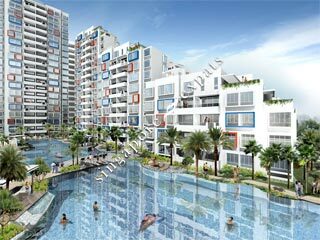 SEAHILL is a 99-year Leasehold Condo development consisting of 338 units. SEAHILL is completed / TOP in 2016 (estimated), developed by BOO HAN HOLDINGS PTE LTD.
Educational institutions like INTERNATIONAL COMMUNITY SCHOOL, UNITED WORLD COLLEGE OF SOUTH EAST ASIA (DOVER), THE JAPANESE SCHOOL, QIFA PRIMARY SCHOOL, CLEMENTI PRIMARY SCHOOL and PEI TONG PRIMARY SCHOOL are near to SEAHILL. SEAHILL is accessible via nearby CLEMENTI, DOVER and KENT RIDGE MRT Stations. A great place for living and play. It is a nice location. It is next to west coast park. It is with luxious sky swimming pool.